Beautiful brand new house and furniture in the small town of Tonco, in the Monferrato region of Italy. Beautiful scenery all year long. The house is very cozy and comfortable for a large family or group of friends. Its 40 minutes away from Torino, 30 minutes from Alba, 20 minutes from Moncalvo, 10 from Asti, in the hart of beautiful wine country of Monferrato. The house includes 5 bedrooms and 3 and a half bathrooms, large parking space. The property has a full kitchen and dining room, living room with fire place and a beautiful terrace to enjoy either in summer or the autumn. Im an attorney living in Mexico with family ties to Italy. I purchase the house to keep the ties with my family. The property is my vacation home. I use it 3 months in the summer and a month in December to enjoy the holidays in Italy. Its a very comfortable home, with all brand new furniture and amenities. Good place to enjoy a vacation in Italy. Small country town of Tonco in the Monferrato region, perfect for enjoying wine testing in near by wineries, superb restaurants in neighboring towns and enjoy the real italian life! Smoking not allowed inside the house, but allowed outside the house. First of all, it's HUGE. We were only two couples so we kind of rattled around in it. There are 3 bedrooms on the main floor including the lovely master-suite. Upstairs there's another bedroom with 2 full beds, as well as a lounge area. There are two bathrooms on the main floor. one off the hallway with a shower, and another with a bathtub off a vestibule of the master-suite, so you can either have it be a private bath OR share it with others. Up stairs is another bathroom with a shower, and downstairs there's a simple WC near the game room & the laundry room. The large kitchen is so gorgeous I want to steal the design! 5 or 6 burners on the stove, a dishwasher, and one of those fabulous Italian drying cupboards over the sink. The balcony looking out over the nearby countryside is perfect for relaxing on a sunny day. Also, the caretaker is the nicest lady and really helpful. There are two little grocery shops in town but they have limited hours at least in March. Several large groceries are only a 20 minute drive away. The local Pizza restaurant is very good, and there are fantastic restaurants and wineries nearby. The house is a lot more than what you see on the pictures. It's in a quiet place of a small village named Tonco, with wonderful views. It's fully equipped with quality IKEA furniture and equipment. There's broadband internet and digital television channels. Nadia is very friendly, welcoming and helping, she was there in 15 minutes when we had a fuse going out. Not all premises are shown on the pictures, the house is larger than 400 square meters. There's even a large empty room which is not used yet. I can confirm all reviews written before mine except that the ping-pong table is not only for kids, it's normal size. We had no logical ideas of why the garage can't be used just that the owner is keeping one of his cars in it since he lives in Mexico. But there's plenty of parking place on the property. For us Tonco was an appropriate resting place to make one-day trips to Torino, Genova, Monaco and Lugano. I would recommend it to anybody who will not amortise this nice new house because we would like come back here again. Thanks of your comments George. We hope to have you again as a Guest at my house. Enjoy your vacations! Next time, we will be clear that you can park inside. Obviously, there is plenty of space and we don't have a problem with that - maybe was a miscommunication. We will be clear about it. Thanks for your comment, we will take it to improve it. New home with very well equipped kitchen and amenities. Breathtaking view of the countryside. The house was really an amazing end to our vacation. 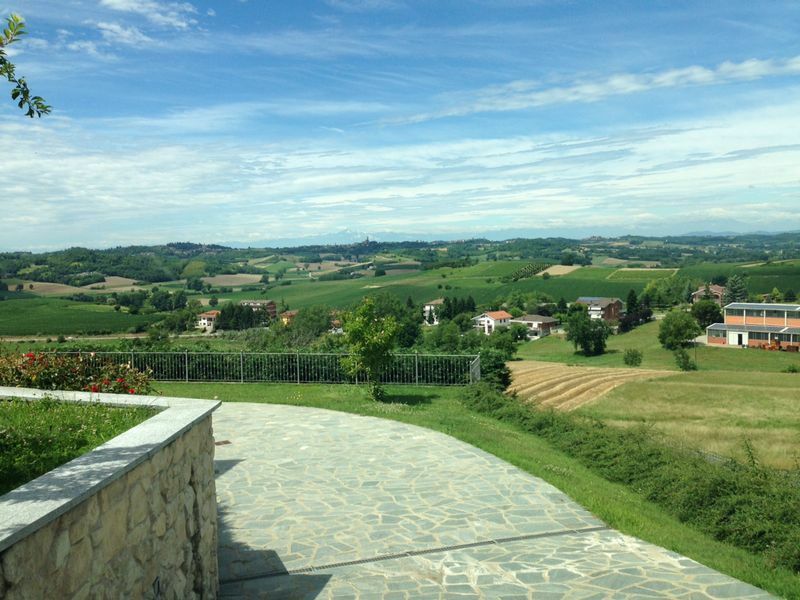 Located near Asti, 45 mins away from Turin, and accesible to entire region. Travelled with 10 people and we were very comfortable in this home. Nadia was very welcoming and very sweet to the kids. Luis was super responsive and agreeable. Tonco is a wonderful small town and we've become fans. Would return to this home, this location and spend more time in the area next time . Thank you Luis for opening up your house to my family and friends. I travel a lot and stay in many different type of properties but your house has been the best by far. I can really tell this is not a rental but the home you live in. Beds were super comfortable, bathrooms perfectly clean and spacious - in italy they can be small - and kitchen awesome. Easy drive to supermarkets in Asti or specialty stores in Montalvo and you can have gourmet meals at home. Luis has also been one of the best hosts in terms of replies and advise, truly amazing. Cant wait to come back and visit, anyone that stays at this property will have an amazing time. And for small kids there is even a ping pong table!!! Thanks for your comments Marco. If you came back, Im sure there will be more amenities in the future for the kids (and my kids -ja). All the money we take from the rent its reinvested for improving the property. I hope you return, you are very welcome as a great guest! Having never been to this part of Italy we were overwhelmed with how fortunate we felt to be able to stay in this home in this beautiful town. The first and possibly most important fact is how accommodating and responsive the Owner Luis is. The family that helps Luis manage the home are two of the most wonderful and helpful people you will ever meet. The home itself is fantastic. We had 6 people ranging in age from 15 to 75 and we took great advantage of the wonderful kitchen...spacious bedrooms..and immaculate bathrooms and family rooms. No picture can truly capture the views from the wonderful outdoor deck...when the skies are clear the view of the Mountains combined with the picturesque Hilltop cities honestly take your breath away. In two short weeks we felt as though we became part of Italy and this wonderful small town of Tonco became part of our families soul. It is an easy drive from the Torino airport and near more good food and Wine and small markets than you can believe. It is a wonderful home that will leave its impression deep in your mind and heart. Thank you Luis and Nadia and Armando...Grazie Mille....Brian and Kim Rath and Family.. Thanks for your kind words. If was a pleasure having you as a Guest, and I hope you can return some day to the little an surprising Tonco! Bella casa, molto grande ed accogliente, vista meravigliosa. Il proprietario abita in Messico ma siamo stati accolti da una Signora del posto molto gentile e disponibile che ci ha spiegato tutti i dettagli della casa. L'abitazione è molto grande, ideale per 3 famiglie con bambini, la cucina è molto bella, super attrezzata e fornita di molti generi alimentari (utilissimi quando si soggiorna per brevi periodi). L'arredamento è curato, ci sono candele ovunque che rendono l'atmosfera davvero piacevole. C'è una splebdida terrazza da cui si gode la vista sulle colline. Si vede che c'è passione e che i proprietari ci tengono alla cura dei dettagli per migliorare l'aspetto ed il comfort della casa. Forse l'unica pecca (anche se comprensibile) è stato il non poter accendere il meraviglioso caminetto del salotto (non c'era legna a disposizione). L'ubicazione è molto comoda per raggiungere le varie località del Monferrato. Il punteggio corretto sarebbe 4,5, la consiglio!